The internet has become an increasingly important tool for parents, especially for Millennial moms and dads. 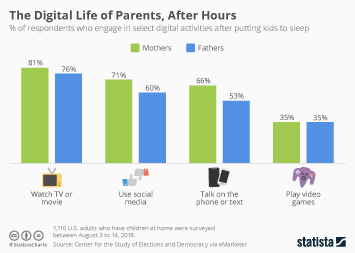 Mobile devices have enabled parents to stay better connected with online and offline support networks, look up information away from the computer and enjoy digital short-form entertainment. As of January 2017, mothers in the United States spent an average of 211 browsing the internet on a daily basis, compared to only 138 daily minutes of TV consumption. In January 2017, it was found that smartphone ownership among U.S. moms had overtaken laptop and PC ownership. Overall, 86 percent of Millennial moms owned a smartphone and 65 percent owned a tablet. During a Fall 2014 survey, it was found that parents in the United States were frequently giving and receiving support on social media, mostly by responding to good news by liking or commenting on positive status updates by others, as well as getting useful information and gaining support for themselves. Mothers were found to be far more active on social media than fathers and, on average, received more support on social media regarding parenting issues. In total, 31 percent of parents asked parenting questions on social media. Overall, Facebook was the most popular social network among online parents, followed by Pinterest and LinkedIn with three quarters of parents accessing Facebook on a daily basis. Despite the benefits of social media, 68 percent of social media using moms felt that their parenting decisions were judged at least sometimes by other moms. On top of being online savvy for their own purposes, parents also had to learn to teach their children about safe behavior in the online environment. Gone are the free for all days when parents did not know or care about the internet – many now-parents grew up with computers and are aware that sometimes, the internet is indeed forever and risky online behavior can severely impact someone’s life. During a June 2016 survey of parents to teenagers in the United States, it was revealed that 50 percent of responding parents regarded the prevention of identity theft as the most popular online safety topic. Other important digital usage issues included device security, how to identify fake emails and social media posts and how to report serious problems. Despite the many reasons for parents not to monitor their children’s activities online, many parents have adopted strategies to stop risky online behavior of their children. March 2015 data revealed the most common parental online restriction strategies to be password protection of devices, antivirus and security software and device-free days. On top of this, discussing social media risks openly with their children has also been a priority for many parents – 80 percent have discussed cyber bulling with their kids, and 73 percent have talked about cyber criminals and identity theft and the subsequent importance of online privacy.